More Tapas! In Nottingham we are already well furnished with Iberico, Baresca and Beeston’s Frustrated Chef. Barrio is another addition to the burgeoning Sherwood food scene where The Bakehouse and drinks venues The Pillar Box and Kraftwerks are thriving. It’s entrance on Mansfield Road is inconspicuous and despite spending a decent amount of time in the area recently I had been oblivious to its existence! Barrio’s small interior is a ramshackle affair with random objects scattered across bookshelves and cabinets. We were handed a dirty scrap of paper that purported to be the menu… possibly the worst example of a menu I think I’ve ever been offered. They didn’t fair much better with some of their descriptions either, “Pork in carrot sauce” certainly leaves some work for the imagination! My usual barometer for Spanish food failed to set the evening alight. The Patatas bravas was disappointingly soft but did have a nice hit of paprika. Fritto misto (fried fish) was also a little under cooked but fresh and pleasant, served with some Calamari which somehow rubbery but lacking crispy batter?! Things did pick up from there, you can’t do much wrong with padron peppers but they were nicely charred with plenty of sea salt. Chicory filled with blue cheese and cream were packed with flavour, perhaps a little too strong on the cheese, for £3 though the value couldn’t be questioned. 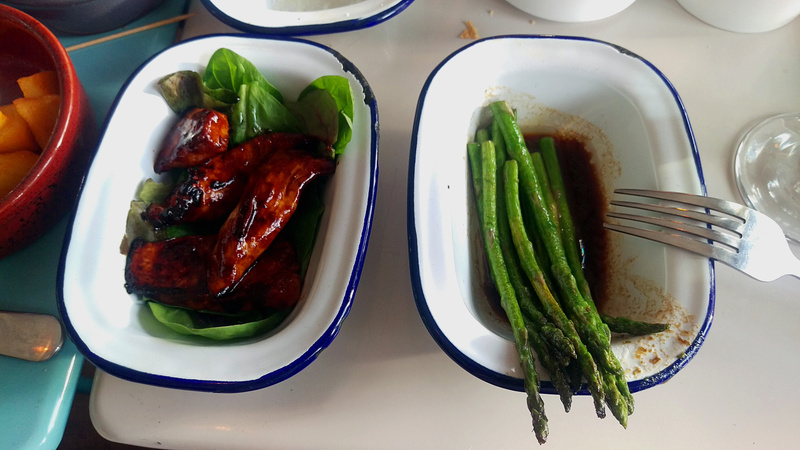 For just another £3 my favourite dish arrived, plentiful (if thin) asparagus was served in a garlic and soy dressing. A little different from the mainly Spanish menu but great flavour and they could probably have charged double for what is a quite premium ingredient. Another good dish was the marinated chicken, it was in a similar vein to the oriental inspired asparagus. Sticky and tasty. 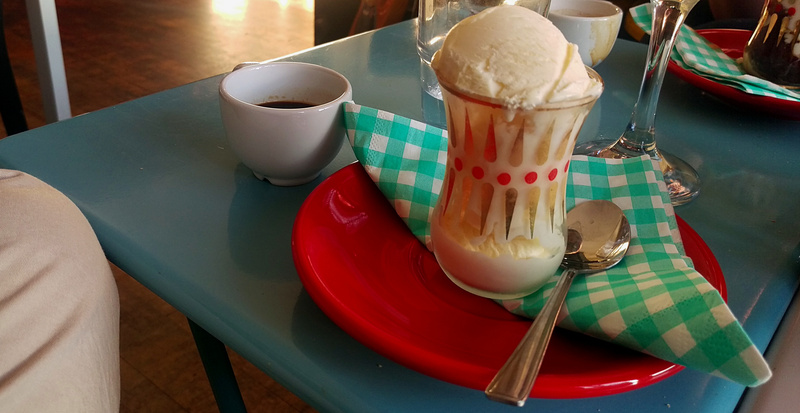 As a quintessentially Italian dish I was surprised to see Affogato on the menu. It is one of my go-to desserts so, Spain be damned, I couldn’t help but pick it. It was served in a pretty, vintage glass which unfortunately presented me with some serious logistical challenges. Firstly the cup containing the espresso was difficult to pour – tricky enough without a glass full to the brim with ice cream. Where did they expect me to put the coffee exactly? Having fumbled around in my attempts I managed to combine the elements… and despite the palaver it did taste good. There was something charming about Barrio. Maybe because it was rough around the edges and lacked a commercial edge. The food was mixed but the best dishes were enjoyable and I was impressed at what you get for the money with reasonable prices throughout. I couldn’t say it competes with any of the city centre competition when it comes to the food but if you’re looking for something a little more cheap and rustic then it is something different. I’m sure I’ll be back at some point to see if they’ve added a bit more polish to proceedings.